Please Read through our Policies Prior to signing your Rental Contract Through fair and consistent policies, we have established and met the various needs of our many customers. Yet, should you have an individual request that may be extraordinary and outside of the norm, feel free to share your ideas with our staff. After all, this is your Special Event! We are here for you! We highly recommend that reservations are made early and well in advance. Timely reservations help to ensure that your items will be available and set aside for your Special Event. Early planning allows our staff the needed time to prepare, package and double check your order so that there are no missing items on your delivery or pick-up dates. We understand that events and circumstances may be altered during the planning phase and we will do our best to accommodate any changes you need to request. This of course will be dependent upon our inventory. Once Inside 30 day of Rental Period and Final Payment has Been Made the Rental is 100% Non-Refundable on all Unwanted/Needed Items. Our Rates are assessed per event. Typically, Customer Pick Up orders can be taken the day before your event and returned the day following your event. Extended time rental rates are available upon request. Items with a late return are subject to additional rental charges. Delivery We Typically Deliver on Thursday & Friday for Your Saturday & Sunday Events & Pick up Sunday or Monday. We will Base Delivery Date & Times based on the Orders. Please Let us Know at time of Booking if Special Dates & Times are Required for your Event, Normal Delivery Hours Begin at 9am until 6pm any times before or After are subject to after-hours Fee’s. Deposits: 50% of your Total Rental is due to Confirm your Items & Date (Non-Refundable) Final Payment: Due 30 Days Prior to your Event Last Minute Rentals Inside 30 Days: Full Payment to Book All Payments inside 30 Days are 100% Non-Refundable, and any Unused Items are 100% Non-Refundable LGS Events & Party Rental~Accepts Visa & MasterCard credit cards as well as cash. Checks will be taken as payment for Events Outside of 30 days & Must be accompanied with a current and valid driver’s license and a major credit card on File for Damages. Delivery fees are determined by order size and zip code. Standard Delivery includes delivery and pickup via level portage not over 50 feet from our truck(s). If access to the installation site is more difficult, additional labor charges will be assessed. Our delivery teams are instructed always to neatly stack all items in a mutually convenient location. We usually schedule deliveries 3 to 4 days before your event. Our LGS Staff will call the designated onsite person the day before your delivery date with estimated delivery times to make the arrangements you have requested. Please note, we will Give you a 2 Hour delivery window Our policy is to provide the best service to all of our customers. On occasion, special circumstances will require additional time at a particular event site. In order to facilitate a smooth and hassle-free pick -up of the inventory, all rental equipment must be taken down and placed in containers in the same manner in which it was delivered Please make sure everything is ready for pick up. Rental items that are not prepared and ready for the scheduled time frames will be subjected to additional rental, labor and pick-up fees. Our LGS delivery Staff inventory counts will be treated as FINAL COUNT if there is no customer Staff present upon delivery or pickup. All glassware, china, silver and flatware must be rinsed and free of food and liquids and placed into the containers in which they arrived. Barbeque grills and Chaffing Pans Must be Free of oils, ashes, coals and food product in order to avoid an additional $100 cleaning fee. Chairs: Do Not Stand on Chairs this can cause Bodily harm to you as well as damage to the Chairs, if Chairs are Being Used outside any Mud needs to wiped free at end of rental any Tables & Chairs returned with Excess Mud, Dirt, Food Debris or Damage will be Charged a Cleaning fee starting at $100 & Up depending on size of Order and extent of Cleaning Required. All Our Customers Deserve Quality Items Please Respect all items and Return them in the Same Condition as you Received them. Linen items must be shaken and left to partially dry if possible in order to prevent mildew and stains. Please do not place linens in plastic bags for pick up as this may lead to mildew which can destroy the material. Use the provided bag or bags. Be sure to locate all linens and count them carefully. Once we deliver the rental item(s), these rental items become the client’s responsibility. Please understand that we must charge for the repair or replacement of the lost and / or damaged items. Reservations MUST BE cancelled in Writing Please Note All Rentals with LGS Events are 100% Non-Refundable Deposits and rentals Inside 30 days. All Tents Rented Require Delivery for your Event & Includes set up & Take down of Tent Only all Tents are Required to Be Secured if Tent Stakes can’t be used at your Venue then Water Barrels will be Required & Access to Water to Fill Barrels if No Water is Available Prior Notice is Required so we can have them Pre-Filled. Area where the Tents will be Placed Must be Free of Tree’s & Poles Once Tent is Placed and Secure the Tent is the Responsibility of the Renter with Full Liability. Tents are temporary structures designed to provide limited protection from weather conditions, primarily sun and rain. However, there may be situations, particularly those involving strong winds and lightning, in which the tents will not provide protection and may even be damaged or blown over. Evacuation of tents to avoid possible injury is recommended when severe weather threatens the area where the tents are erected. People must leave the tents during such conditions. In the event of a predicted or actual storm or excessive winds, we may dismantle any equipment that has been previously installed to ensure safety of all involved. Installation of a tent must be done correctly for the protection of the users, the tent, and ultimately the success of your event. Therefore, it is our strict policy that all installations and takedowns are done by our experienced crews. All prices quoted will include these services. For a traditional tent, the first step our crews take when installing a tent is to spread it flat on the ground in the location in which it will be erected. It is important that the client has cleared the area of obstructions before our arrival onsite. Post-event, the tent must be totally empty before we can take it down. If our crew has to clear the site before setup or take down, additional labor fees will be applied due to the additional time and delay. Tent pricing is based on installation over a flat, grassy surface that is accessible to our trucks during our normal installation schedule. Some installations may require additional fees based on a variety of site specific factors. Please Note the Items you rent may Very in Looks compared to the Items seen on our Web site, we keep updated pictures on our web site however due to Items being Damaged and or Missing sometimes we have to replace an item or upgrade and Item and they may vary in Looks they will be same Product due to use may vary in looks. 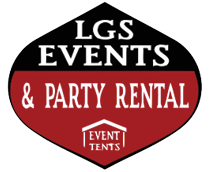 LGS Events & Party Rental is not responsible for any Damage done to Property and or persons of any event, The Customer Person on the Contract takes full responsibility for all Items once Procession is taken, any Damages done to any Items of LGS Events & Party Rental will be charged Replacement cost of such item, any Damages that occur to Property of LGS Events the renter has 14 days from time of Claim to pay for such damages or LGS Events & Party rental will take legal action to recover the cost of Damaged items if not settled.